The economy continues to deteriorate, with high inflation and sharply increasing government debt. After her re-election in 2014, Dilma Rousseff of the Workers’ Party (Partido dos Trabalhadores, PT) started her second term promising a return to more orthodox macroeconomic policies, such as combating inflation and trimming the budget deficit. However, since late 2014 the administration and the ruling Workers’ Party have come under pressure due to a massive corruption scandal involving state oil company Petrobras. State prosecutors alleged leading construction companies and other businesses paid huge bribes to high-ranking officials of Petrobras and to politicians, mainly from the Workers’ Party, in return for contracts. To date, more than 100 people have been arrested in the two-year investigation, including politicians and former top executives at Petrobras, and some from the country's biggest construction firms. President Rousseff, who chaired Petrobras when much of the corruption is believed to have taken place, has been cleared of involvement, but is still threatened by an impeachment proceeding on charges of manipulation in order to hide a growing public deficit. The government’s weakness and the Petrobras scandal seriously hamper the administration’s legislative agenda and have affected foreign and domestic investors’ sentiment. 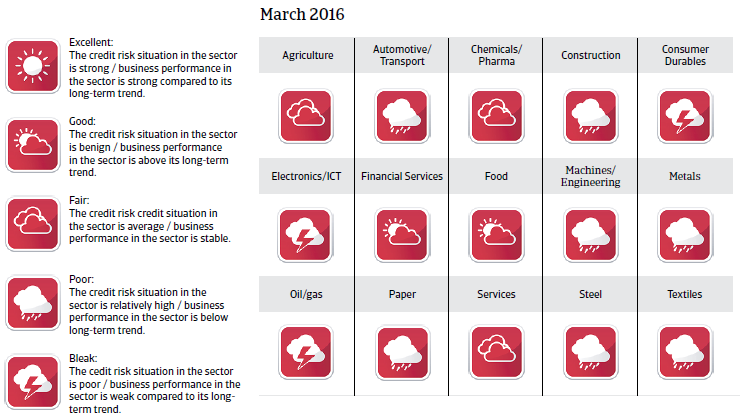 The chances that urgently needed growth-enhancing structural reforms will be taken up (e.g. reforming the pension and tax system, reducing bureaucracy and corruption and improving education) have faded. It remains very uncertain if President Rousseff will continue to support more orthodox policies, given that such adjustments would be politically painful. 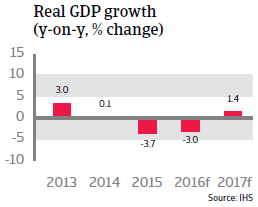 Brazil’s economic growth already started to slow down in 2014, mainly due to weak domestic and foreign demand and decreased commodity prices. Additionally, major supply side constraints (low investment and savings ratios, weak infrastructure, complex business and regulatory environments) had an adverse effect on the economy. 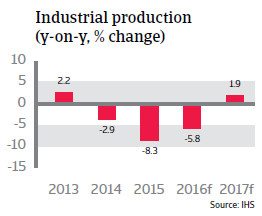 The contraction deepened in 2015, with sharp decreases in private consumption, investment and industrial production, due to fiscal and monetary tightening, deteriorated business and consumer confidence and the negative impact of the Petrobras corruption scandal, which was much larger than anticipated (especially on oil and gas and the construction sectors). Due to the scandal, new investments are being put on hold and many companies may face financial difficulties (Petrobras investments alone represent 2% of Brazil's GDP). The economy is forecast to contract further in 2016, by 3.0% with unemployment rising to nearly 10%. Only a weak 1.4% GDP rebound is expected in 2017. 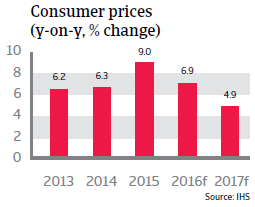 Inflation increased to 9% in 2015, well above the 6.5% ceiling of the Central Bank’s target range, mainly due to tax increases and the sharp depreciation of the real. To slow price increases, the Central Bank has raised the SELIC benchmark interest rate (its overnight lending rate) several times since October 2014, to 14.25% - the highest level in more than 10 years. However, at the same time, those high interest rates impede investments and lending. Inflation is expected to remain high in 2016, at around 7%. Until 2014 Brazil’s fiscal policy was quite expansionary, as investment to exploit the huge offshore oil fields, the 2014 FIFA World Cup and the 2016 Olympics fuelled public sector spending. The budget deficit increased to 6% of GDP in 2014, and despite the implementation of fiscal austerity , it rose to more than 9% in 2015, with government debt increasing to more than 60% of GDP. 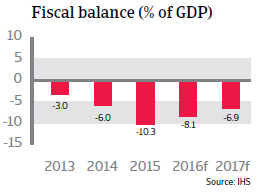 In 2016, an 8% fiscal deficit is forecast as a consequence of higher interest expenditures, falling revenues, a shrinking GDP and losses associated with currency swaps provided to businesses. Government debt is forecast to increase above 70% of GDP in 2016. Fiscal consolidation is becoming increasingly difficult due to the deep economic contraction, high interest rates and a Congress obstructing the passing of fiscal adjustment measures. Additionally, the current government crisis has heightened concerns over the administration's ability to bolster public finances, while repeated revisions in fiscal targets have added to concerns about its willingness to do so. For example, the government seems unwilling to raise the retirement age, while 40% of the (non-interest) public spending is devoted to pensions. That said, most of the debt is domestically financed in local currency at an average maturity of 6.5 years, while the government is a net-external creditor. This mitigates currency, refinancing and sovereign default risk. Currency depreciation and the on-going recession have increased worries about the health of corporate balance sheets. Non-financial corporate debt in Brazil increased from 30% of GDP at the end of 2007, to 49% of GDP in H1 of 2015. Although this level is still modest, the increase is one of the highest among emerging market economies. However, the fact that almost 90% of this debt is financed domestically and in local currency mitigates the refinancing and currency risk. With 49% of export receipts, the external debt of Brazilian businesses is at a relatively high level, but it seems that many companies that borrow in foreign currency are adequately hedged. That said, corporates operating in the commodity sector that have borrowed extensively in foreign currency face higher risks, as their earnings are negatively affected by low commodity prices. Moreover, their debt servicing costs are under upward pressure due to the high currency depreciation. Brazil’s banking sector is well regulated and sufficiently capitalised. The system is not dollarized and the dependency on external wholesale financing is low, shielding the banking system from adverse shocks. Brazil remains vulnerable to changing investors’ sentiment, due to a relatively high stock of portfolio investment inflows (96% of international reserves in January 2016). However, a strong financial sector and relatively low external refinancing needs enable the flexible exchange rate to act as a shock absorber. 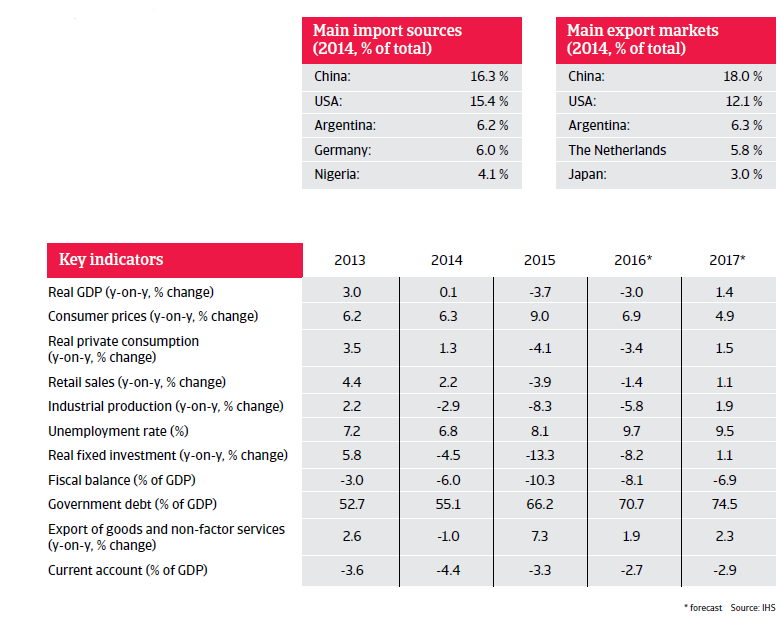 Brazil’s external financial situation is expected to remain robust. External debt is still quite low and liquidity is more than sufficient to cover imports (more than 15 months) and external refinancing needs. 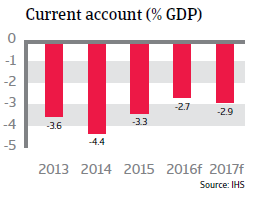 The currency depreciation and weak domestic demand contribute to a correction of external imbalances: the trade balance returned to a surplus and the current account deficit is decreasing on the back of lower imports.